No doubt about it, he appears to be leading the dancers in this classic Spike Jonze video for Fatboy Slim's Praise You. Legendary geopolitical operator Prince Bandar ("Bush") bin Sultan bin Abdulaziz of Saudi Arabia -- looking remarkably well for a dead man -- meets Russian President Putin with the two countries in diametrically opposed positions on Syria. Photo: from SUSRIS since our earlier Al Arabiya link is mysteriously busted. Daily Telegraph -- The Bank of England has admitted its role in one of the most controversial episodes in its history - helping the Nazis sell gold plundered from Czechoslovakia months before the outbreak of the Second World War. We already knew that the Bank of England had its hands on some dodgy gold via the classic Bank dinner scene in Goldfinger. Image via Mitteleuropa film locations. So ... acknowledging up front that this blog seems to coming All Wall Street Journal Criticism All The Time ... the US government has an ostensibly worthy entity called the US Commission on International Religious Freedom. In Friday's WSJ, two of its members -- Princeton professor Robert "Robby" George and Katrina Lantos Swett -- argue that that the US has a legitimate role advocating world-wide for the freedom of people to believe in any religion, or none. That's fine in principle, the question is what specific foreign policies this might justify, upon which they don't elaborate. The British religious thinker John Henry Newman observed in 1874 that "conscience has rights because it has duties." We honor the rights of conscience in matters of faith because people must be free to fulfill what they believe to be their solemn duties. First, I am using the word "conscience" in the high sense in which I have already explained it,—not as a fancy or an opinion, but as a dutiful obedience to what claims to be a divine voice, speaking within us; and that this is the view properly to be taken of it, I shall not attempt to prove here, but shall assume it as a first principle.. Secondly, I observe that conscience is not a judgment upon any speculative truth, any abstract doctrine, but bears immediately on conduct, on something to be done or not done. "Conscience," says St. Thomas, "is the practical judgment or dictate of reason, by which we judge what hic et nunc is to be done as being good, or to be avoided as evil." Hence conscience cannot come into direct collision with the Church's or the Pope's infallibility; which is engaged in general propositions, and in the condemnation of particular and given errors. but in this age, with a large portion of the public, it is the very right and freedom of conscience to dispense with conscience, to ignore a Lawgiver and Judge, to be independent of unseen obligations. It becomes a licence to take up any or no religion, to take up this or that and let it go again, to go to church, to go to chapel, to boast of being above all religions and to be an impartial critic of each of them. Conscience is a stern monitor, but in this century it has been superseded by a counterfeit, which the eighteen centuries prior to it never heard of, and could not have mistaken for it, if they had. It is the right of self-will. Thus, invoking Newman on conscience may have been a nice rhetorical flourish, it carries a lot more weight than you'd understand from how it is used above. Photo: Newman House on St Stephen's Green in Dublin via Wikipedia, the ancestor of University College, Dublin. When Barack Obama ran for president in 2008, he promised that America would be more respected and liked in the world. Foreign leaders would bow to his wishes. Ancient conflicts would end. In a speech before hundreds of thousands in Berlin, he vowed to do nothing less than "remake the world." It's obvious from the context of that paragraph that he was talking about a generation remaking the world. not himself. The attribution of the "remake the world" to Obama for himself seems to have originated with Mike Allen at Politico. His agenda for the continent [Africa]? The president told African leaders in Tanzania on July 1 that his priority is to "modernize customs, move to more efficient border crossings, reduce bottlenecks, reduce the roadblocks that stymie the flow of goods." This was worthy of a speech by a commercial attaché, not a U.S. president. Indeed, President Obama did make those remarks to African leaders. African business leaders -- who would want to hear about commercial issues. When he was talking to actual African leaders, he talked about the developmental issues you'd expect him to talk about. Incidentally, the WSJ's description of Rove notes that he helped organize the political action committee American Crossroads -- a description that never appeared during the 2012 election season when Rove had the same slot on the Thursday op-ed page. The rapid economic development of Central and Eastern Europe counts as one of the Continent's success stories of the last 20 years, and no small part of the revival had to do with the flat tax. Beginning in the mid-1990s, several governments east of the river Oder tried flat taxes to lure investment and promote growth. Early success in the Baltics caused the idea to spread. This time last year, more than a dozen European capitals from Prague to Tbilisi taxed income at a single, flat rate. In fairness, there's nothing worse about their proposed Transition II programme for Greece, Spain, Portugal, Cyprus, and Italy than what Eurocrats actually have on the table. Australian immigration demographics presently imply that such a divorce won't occur, because immigrants into Australia from dictatorships and former communist countries tend to equate the constitutional monarchy with domestic political tranquillity, the rule of law and limited government. If the baby prince turns out to be as photogenic as his parents, all that Prince William and the Duchess of Cambridge will have to do is visit Australia on the eve of any republican referendum to bury the movement's chances there. The really important principle in the Argentine case that needs defending is not about minority creditors and a deadbeat government. At stake is New York's status as the top destination for sovereigns to issue bonds. Some $420 billion in sovereign debt subject to New York law is outstanding, and this market cannot operate smoothly unless creditors are able to enforce contracts. If Argentina gets away with stiffing creditors, one consequence will be that lenders in the future will demand higher rates for their higher risk; another is that they won't make loans. 1. Why should the interest of one particular place, New York, in being a bond issuing center, drive the important global public policy question of when and how countries can default? 2. The table above is from the Rogoff and Reinhart book, This Time Is Different (note: book has very different intellectual history than the similarly-authored article). What exactly did the investors in Argentina bonds think they were getting into? In Sunday's New York Times, conservative columnist Ross Douthat looks to place the current controversy about abortion restrictions in Texas in an international context and specifically by comparison with Ireland, where as he notes there are some similarities in the destination to which Texas appears headed, namely severe limitations on legal abortion but a right to travel outside the jurisdiction. His point is that Ireland doesn't look like the benighted anti-women inferno which he infers as a theme of the pro-choice rhetoric in Texas. A couple of reactions. First, his column contains the subheading What Dublin's experience means for Dallas's future. It could just as easily be What Belfast's experience means for Dallas's future. Because Northern Ireland has essentially the same landscape of access to abortion as the Republic, with only the recent exception of the arrival of the Marie Stopes clinic in Belfast. Both sides of the border, the National Health Service in Britain remains the key fallback mechanism for access to abortion. Second, as Douthat admits,an important backdrop in the European case is good access to health services in general, something that Texas is busy shredding. Strangely through he views this as something that liberals should be putting more energy into countering, when his own comparison suggests that it's pro-life conservatives who are being the hypocrites. Finally, if you're looking for one decisive indicator or country comparison to make a devastating critique of one side or the other in the abortion debate, you're not going to find it. European indicators for child and maternal health show all sorts of variation that is not obviously correlated with the stance on abortion, but there are hints of that landmine variable of "culture" playing a significant role. Also perhaps important in that Ireland-Texas comparison: Ireland confines its biggest political clowns in the abortion debate to a weak upper house of the legislature, but in Texas, they run the state. 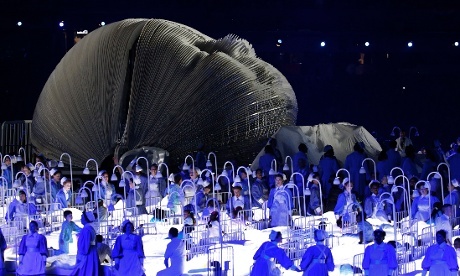 Photo: London Olympics NHS tribute via the Guardian. The group photo from the meeting from the Group of 20 largest economies (G20) finance ministers and central bank governors in Moscow today. If you're counting, that's 4 women in total, one of whom (Mme Lagarde) is there in her IMF capacity and not as a G20 member. Beware the sledgehammer used to crack the nut. In this case, the nut is the U.S. government's laudable goal of catching tax evaders. The sledgehammer is the overreaching effect of legislation that is alienating other countries and resulting in millions of U.S. citizens abroad being forced to either painfully reconsider their nationality, or face a lifetime of onerous bureaucracy, expense and privacy invasion. The legislation is Fatca, the Foreign Account Tax Compliance Act (FATCA). The other big push on tax is to move from an “on request” model of information exchange, where countries have to cajole each other to hand over data, to one where they are swapped automatically. This is already well under way, thanks to America’s Foreign Account Tax Compliance Act (FATCA), which has inspired European countries to make similar demands. It could become the global standard within a decade. Offshore centres are starting to sign up, calculating that a voluntary move now may mean better terms. European laggards, such as Switzerland, Austria and Luxembourg, are also reluctantly increasing compliance. This will make it harder to hide assets abroad. There's a precedent for this. The US Foreign Corrupt Practices Act (FCPA) used to be bashed by well-heeled interests in the US as putting Americans at a disadvantage overseas, since other countries had laxer corruption laws. But over time, especially due to pressure from poor countries, FCPA became the template. The same thing is happening to FATCA. Even as the horror stories about Americans being turned away from banks trickled in, European countries -- like Ireland! -- saw which way the wind was blowing and did deals with the US to ease the implementation burden. Now the language of international summits is all about having a "Global FATCA." Sure, banks have to do more work because of it. Those poor banks! It's odd to see the shocked, shocked tone of news reports on vicious discord in the Australia cricket dressing room when it takes about 2 seconds to read up on the sectarianism of the 1930s counterpart thereof, Don Bradman v Jack Fingleton in particular. As of June 30, 2013, total capital was $240.08 billion, consisting of $78.04 billion in total shareholders’ equity (common shareholders’ equity of $70.84 billion and preferred stock of $7.20 billion) and $162.04 billion in unsecured long-term borrowings. It's quite a trick that banks can do, getting to count borrowed money as "capital" -- 2/3 of its total capital, in the case of the Vampire Squid. Presumably the wheeze is that since the money is unsecured and long-term, Goldman Sachs can use it to absorb losses. But of course, when you're too big to fail and too connected to fail and you've got a hotline to the central bank, borrowing unsecured and long-term so that the regulators can check off the "well capitalized" box is probably pretty easy. The trap on this path could also ensnare the new Wimbledon champion Andy Murray, a Scotsman who won a gold medal for Britain at the London Games because his homeland does not field an Olympic team. A movement in Scotland to gain independence from Britain, if successful, would make Murray the McIlroy of tennis. An independent Scotland would be, er, independent and therefore it would have an Olympic team that Murray could represent. Northern Ireland is part of the UK which competes in the Olympics as "Team GB" which doesn't map well to Ireland's mixed identities. That's the problem. Did an editor want an Andy Murray reference for enhanced news topicality? 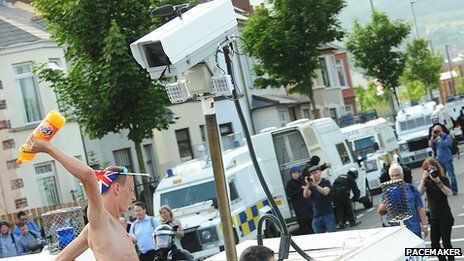 On the same weekend that the Republic of Ireland gets around to updating its century plus old abortion law, Ulster Loyalists take off their shirts in a heatwave to yell about a 1690 battle and throw stuff at the police. Photo: part of slideshow at BBC online Belfast parades story. The new “constitutional declaration” laid out an election schedule that analysts called implausibly speedy. The plan calls for a panel of 10 jurists — 6 judges and 4 law professors — to present a sweeping package of amendments in just one month. A group of 50 representatives of various government institutions, parties, guilds and social groups — including 10 who are either women or young — will then review the text for two months. But it is not clear what power they have to make changes or how they will make their decisions. ... It is unclear who will select the panel of 10 jurists or the 50 who will review their work on the new charter. Nor is the precise role of those 50 explained. Although normally representatives of the public settle on broad principles for experts to draft into a charter, the new plan calls for the experts to finish their work before the debate can begin, said Zaid Ali, an analyst at the International Institute for Democracy and Electoral Assistance, an intergovernmental group. CAIRO — The military officers governing Egypt on Tuesday convened a panel of jurists, including an outspoken Muslim Brotherhood politician, to revise the country’s Constitution in the first tangible evidence of a commitment to move the country toward democracy after President Hosni Mubarak’s ouster. In an incongruous scene — unimaginable just one month ago — Field Marshal Mohamed Hussein Tantawi, the defense minister acting as chief of state, appointed a panel of eight experts led by a retired judge known as a leading critic of the Mubarak government. In other words, the big plan now -- as two years ago -- is to put Egyptian lawyers in charge of the transition to democracy. In the Arab countries that your intrepid blogger has been to, if you want to kill something, you put Egyptian lawyers in charge of it. Yes, it's probably a sign we're old but here's a recent Temples video. For Greece, the end of this rescue can't come soon enough. And the end may have to begin with an acknowledgment that loaning Greece the equivalent of 100% of its GDP to address its excessive debt problems was never going to work out as intended. Writing off the loans to Greece would be politically difficult—one reason that Angela Merkel doesn't even want to discuss the matter until after September's elections in Germany. It would raise questions about equal treatment of countries like Ireland, which is facing a crushing EU debt burden of its own. 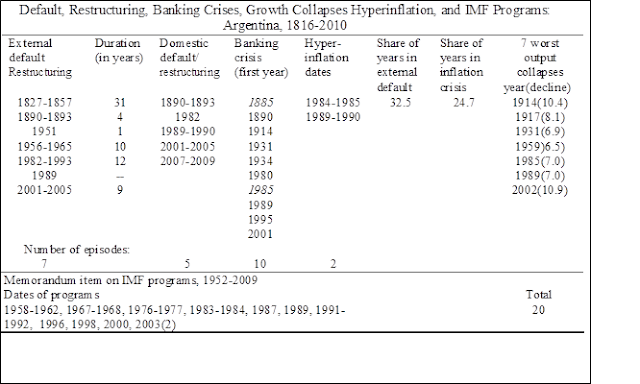 And Greece is responsible for having gotten itself into a mess in the first place. Some analysts also think that when Portugal needs more help from Europe, it is likely to include some element of losses for debt holders, or private sector involvement (PSI), especially as it is set to happen after Germany's election in September. This bill is supposedly “required” by the European Court of Human Rights’s decision in ABC vs. Ireland two years ago. The lead party in the government, Fine Gael, campaigned in the last election on a promise not to legalize abortion. It is abandoning that commitment now, and the Irish people are expressing their outrage ... Will the Irish politicians allow the Irish people to decide the abortion issue, or will they bow to the European Court of Human Rights? It's a very constricted view to begin Ireland's abortion narrative with a 2010 ECHR decision. Instead it goes back -- as Irish people painfully recall -- to an ill-advised "pro-life" amendment to the Irish constitution which ended up being interpreted by Irish -- not European -- courts as creating a limited right to abortion under certain medical and psychological circumstances. But no enabling legislation was ever passed on foot of these decisions, until embarrassments (like the ECHR decision) and tragedies (like the Savita case) induced the current government to meaningful action. Its objective is to ensure that people understand what the applicable law is, not to open the door to "social abortion" as former Taoiseach Bertie Ahern bizarrely called it. The attitude that Saunders displays risks replicating the outcome of the tactics of Ireland's more unreasonable pro-life activists, whose antics over this law are alienating many in what is still an anti-abortion culture by western European or American standards. In retrospect, I’d say that Huntington committed the Fundamental Attribution Error. That is, he ascribed to traits qualities that are actually determined by context. He argued that people in Arab lands are intrinsically not nationalistic. He argued that they do not hunger for pluralism and democracy in the way these things are understood in the West. But it now appears as though they were simply living in circumstances that did not allow that patriotism or those spiritual hungers to come to the surface. ... Over the past weeks, we’ve seen Arab people ferociously attached to their national identities. We’ve seen them willing to risk their lives for pluralism, openness and democracy. I’d say Huntington was also wrong in the way he defined culture ... But it seems clear that many people in Arab nations do share a universal hunger for liberty. They feel the presence of universal human rights and feel insulted when they are not accorded them. Culture is important, but underneath cultural differences there are these universal aspirations for dignity, for political systems that listen to, respond to and respect the will of the people. He should go across the page to read Shadi Hamid on what actually happened in Algeria. "Radical Islam" never got a chance to govern because the generals blocked them from doing so after an election they'd won. The rest is a brutal civil war and a terrorist group that had developed the idea of hijacking a plane and flying it into the Eiffel tower. Well before 9/11. Aren't smart conservatives supposed to have "unintended consequences" as a reflex? UPDATE: The list of other countries that Brooks gives is pretty shaky in terms of his narrative too. And a lengthier window on his columns shows that the anti-Huntington column was the outlier. The United States continues to believe firmly that the best foundation for lasting stability in Egypt is a democratic political order with participation from all sides and all political parties —secular and religious, civilian and military. Is there any country other than Egypt where "all sides" is taken to include the military? At the same time, we strongly shake hands with the men of all the armed forces, represented by General Abdulfattah Al-Sisi, who managed to save Egypt at this critical moment from a dark tunnel God only could apprehend its dimensions and repercussions, but the wisdom and moderation came out of those men to preserve the rights of all parties in the political process. Thanks to billions spent on covert surveillance, the US government can probably tell you what every ambassador to Washington had for breakfast. But when tumultuous geopolitical developments unfold, as in Egypt, there doesn't appear to be a much of a plan other than "Watch CNN." The all-smiles Paris meeting of French President Francois Hollande with Bolivian President Evo Morales in March wasn't enough to ensure that Morales' official plane could get through French airspace yesterday, on account of an apparently unfounded suspicion that Edward Snowden was on it. Forcing planes, especially small ones, to divert after they've taken off is dangerous. FAZ: Why should German politicians and others in Europe believe that things have really changed in Ireland over the last few years? PH: Well I think they do. They see the extensive changes in personnel and those who interact with Irish officials and policymakers do see how….I think the hubris of the past has definitely gone.